More on the theme of poets and artists: Good friend Sally Reed steered me to a slender volume, Letters on Cézanne by the poet Rainer Maria Rilke. These letters were written mostly to his wife Clara while he was living in Paris in 1907, a time when he was spellbound by Cézanne’s work. Once asked to identify the most formative influences on his poetry, Rilke answered that Paul Cézanne had been his supreme example. “After the master’s death, I followed his traces everywhere.” For Rilke, Cézanne was the sine qua non of the artist who took residence in the very center of his work and stayed in that place of authenticity for 40 years. 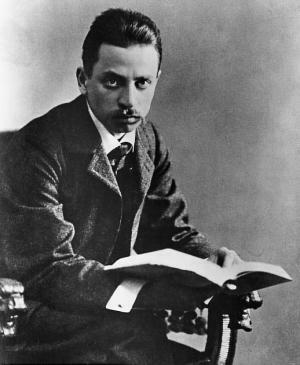 It was that perseverance that brought on a “conflagration of clarity”, said Rilke, and without it, the artist would flounder in the periphery, only capable of accidental successes. Those are deep and profound lessons for a young poet to learn from a painter. Somehow I too must find a way of making things; not plastic, written things, but realities that arise from the craft itself. Somehow I too must discover the smallest constituent element, the cell of my art, the tangible immaterial means of expressing everything. It seems to me that the “ultimate intuitions and insights” will only approach one who lives in his work and remains there, and whoever considers them from afar gains no power over them. For the next thirty years he did nothing but work. Actually without joy, it seems, in a constant rage, in conflict with every single one of his paintings, none of which seemed to achieve what he considered to be the most indispensable thing. La réalisation, he called it, and he found it in the Venetians whom he had seen over and over again in the Louvre and to whom he had given his unreserved recognition. To achieve the conviction and substantiality of things, a reality intensified and potentiated to the point of indestructibility by his experience of the object, this seemed to him to be the purpose of his innermost work. It’s not really painting I’m studying (for despite everything, I remain uncertain about pictures and am slow to learn how to distinguish wha’ts good from what’s less good, and am always confusing early with late works.) It is the turning point in these paintings which I recognized, because I had just reached it in my own work or had at least come close to it somehow. All chatter is misunderstanding. Insight is only within the work. It is mainly an understanding of the decisive role “balance” plays in this art; that balance between the reality of nature and the reality of the image which was Cézanne’s entire striving and which, when he achieved it, he likened to a “folding of hands.” Rilke was well aware that this balance, this perfect equivalence (impossible without previous insight into the inadequacy of mere “representation”) was nothing less than a major event in the history of art. And there is a statement, the most important, perhaps, in the entire sequence of letters, which raises this idea above the level of aesthetic discourse: where he speaks of the “scales of an infinitely responsive conscience…which so incorruptibly reduced a reality to its color content that that reality resumed a new existence in a beyond of color, without any previous memories.” Nowhere has the literature on art come closer to stating Cézanne’s achievement that does Rilke in this sentence. I knew you would love this. And now I love it afresh, as I do every time I look into this miraculous little book. I never “got” Cezanne (I am embarrassed to tell you) until I read these letters. Yes, that is such a great quote Sally. Thanks for adding it and for sending me to this extraordinary book.